How does one get on the writing ladder? It’s important for writers to earn while they’re making a name for themselves. It’s not just about the money. The payment is a statement of acceptance and a validation of your skill. It’s not about how much you get paid, but rather that someone has acknowledged your effort and worth. I’ve worked for years to be published. Along the way, I’ve even self-published a few of my books. Nothing can compare to seeing your name in print, even if it’s at the bottom of a letter in a magazine. This is exactly why I have a regularly updated page with writing opportunities – 98 % of them paid - to give you the help you deserve. However hard the publishing process, there are certain elements that have to fall into place first. No matter how good the story, the writing needs to have a degree of professionalism. If you have a dream of becoming a writer and you’re not sure of your skill, take a writing course before you begin. Courses are easy to come by. One Google search will produce a vast list of very affordable writing/grammar courses to choose from. I have some free English lessons I’ve written on this blog. They’re by no means comprehensive, but do offer the basics in grammar rules, spelling etc. I have a close connection with someone who marks university papers. Many students have taken to plagiarising because the Internet is so packed with any type of information one may need. This is not in reference to students who buy term papers for examples of what’s required of them in terms of citing, formatting etc. (Apparently, colleges will now accept submitted work from students who use a term paper writing service). A writer – if not anything else – is creative. Once the writing has been addressed, your initiative is your biggest, most valuable asset. Use it until you perfect it. A Blogger’s Books shows writers how to start a blog. This is the perfect way to nurture your writing. Writing in private allows you no feedback. Regardless of what you write on your blog, it’s always up for public display, hence criticism and/or feedback. If you’d like to start by writing short articles, see how to properly write online articles on this page. You can also find great ways to get ideas for blog posts here. You’re nothing if you don’t have staying power as a writer. Unless your mother is chief editor at Penguin or Random House (or another huge publishing company) your break won’t come overnight. Remember this and say it to yourself when the rejection letters start piling up. It took me 6 and a half years to find a publisher. If I’d quit after 5 years I wouldn’t be saying that to you now. Staying power is not all, though. Don’t be prepared to give your work away for free. Publishing is the only industry in which it’s okay to ask people to ‘work’ for you for free. I’m sure you’ve seen the so-called ‘job opportunities’ for writers on the web. They ask for thousands of words, they want research, they want style and great product “or else they won’t even consider your work”. What? They want all this for free! If you give into this, I and the other writers who come after us will have to also. Of course, I’m not saying never write anything for free. I’m saying, don’t make this a practice, falsely thinking it ‘may’ lead to something. It more likely will not. See my writing opportunities’ page. I’ve only listed 2 or 3 non-paying jobs (because I think they’re really good). The rest are paid opportunities. 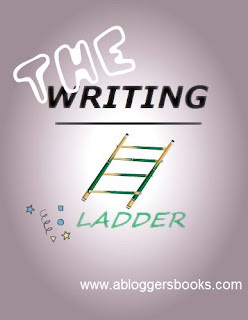 If you liked The Writing Ladder please share it on your social networking sites, or with someone you think could use it. As always, thanks for stopping by. I'm interested to see what you think about this topic. Please leave your thoughts in the comment section below. Please also check out my recently published guest post on Brit Writers Awards' blog. (The Pros and Cons Of Marketing e-Books Via Social Networking). Thanks for the insights. I have been blogging for a few years, but am only now thinking about getting my blog more out there. You are right, without the feedback, you really don't know if your writing is any good. Again Thanks. Your patience paid off and it's true that things have to fall into place before we can see the fruit of our labor.